Gift of Life held its 8th annual Steps for Life 5k Run & Walk of South Florida on Sunday, January 14, drawing over 500 participants to the event held in Boca Raton, Fla. For two special people arriving at South County Regional Park for the event, this would be one of the most exciting days of their lives. One of those people was the generous stem cell donor who had saved the other’s life, and they were about to meet for the first time. It may sound odd that you can save someone’s life without ever meeting them, but when you donate your peripheral blood stem cells or bone marrow, you can save a total stranger from about 80 different diseases, including many forms of blood cancer. Just 18 months ago, South Florida resident Amy Hearin was in a fight for her life, but she was ready to meet the young woman whose generosity had saved her. Steps for Life Chairs Dana Aberman, Donna Krasner and Wendy Schulman – who organized the first race eight years ago – invited Amy to join them on stage. Amy had been unwell during her pregnancy and was initially diagnosed with pregnancy-related anemia, but after her daughter Parker was born, her condition got worse. Her doctors discovered she had a rare form of T-cell lymphoma, and would need a stem cell transplant to survive. Amy was fortunate that Gift of Life quickly found her matching donor in its registry. That blood stem cell donor was New Jersey native Zoe Miller, a 22-year-old graduate student at Tulane University. She came forward to meet Amy, and the two hugged as if they had always known each other. Zoe had joined Gift of Life’s registry during her Birthright trip in 2012, and her swab kit was sponsored by the Adelson Family Foundation. 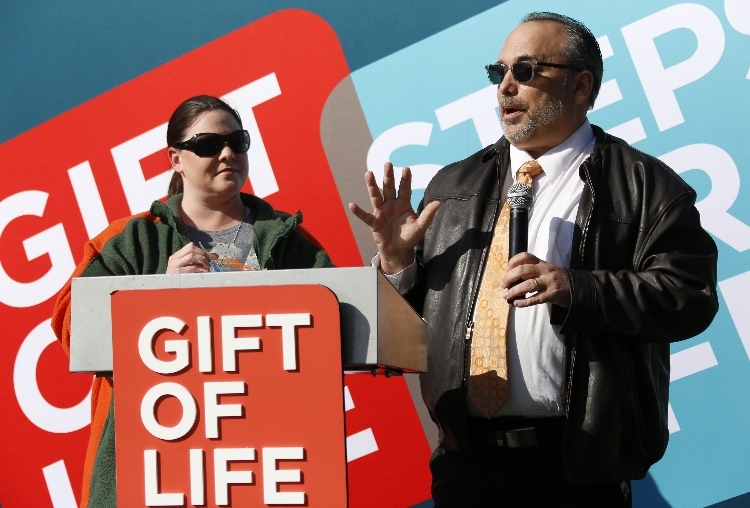 Kelly Valdes (l) presents Palm Beach Post reporter John Pacenti with Gift of Life's Community Hero Award. Keyes Realtors’ Administrative Manager Kelley Valdes took the stage to present Palm Beach Post Investigative Reporter John Pacenti with the Community Hero Award. The award was sponsored by Keyes in recognition of Pacenti’s ongoing coverage of the urgent need to diversify the marrow registry. Kelly explained that when her husband, Manny, was diagnosed with leukemia in 2017, his ancestry as a Cuban-American made it more difficult to find a matching donor. The dire shortage of Hispanic and Latino donors in the registry leaves 55 percent of patients without a match, and like so many others, Manny passed away before a donor could be found. She thanked John for telling Manny’s story with compassion and love, and bringing attention in multiple stories to the plight of Hispanic blood cancer patients. “It was truly a beautiful day, and I know that #MannyStrong was with us,” Kelly said. Chelsea Taylor of WIRK Country Radio served as emcee. The Florida Panthers set up a tent and held giveaways, and one of the team mascots, Viktor E. Ratt, delighted the kids with his antics. Skyler Casson, 10, a member of Young Singers of the Palm Beaches and daughter of Gift of Life’s talented graphic designer, Paul Casson, sang the National Anthem. To kick off the race portion of the morning, a large contingent of amazing superheroes, all aged 6 years and under, lined up to run the Superhero Sprint. Every one of Gift of Life’s littlest heroes received a bright orange cape and were awarded medals for completing the 50-yard dash. Tickle Water gave attending kids plenty to do in the Kids Zone with face painting and bubble wands. Gift of Life’s founder and CEO Jay Feinberg, led off the 5k Run & Walk. 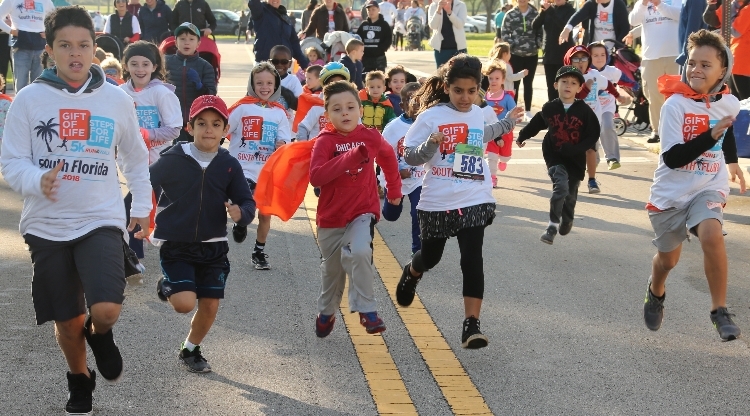 With more than 500 runners from all over South Florida participating, there was plenty of competition for the top spots. Walkers followed the runners out of the starting line and the clear, cool morning made the event enjoyable for everyone. The top male finishers were Caleb Berman, 13 (top finisher for the second year in a row), David Shabtai, 37, and Albert Dimon, 15. Top female finishers were Kimberly Cloutier, 35, Kelly Leary, 40, and Alison Preiss, 27. Full results are available at the Accuchip Timing website. Steps for Life is a fundraiser, and once again both teams and individuals did an amazing job! 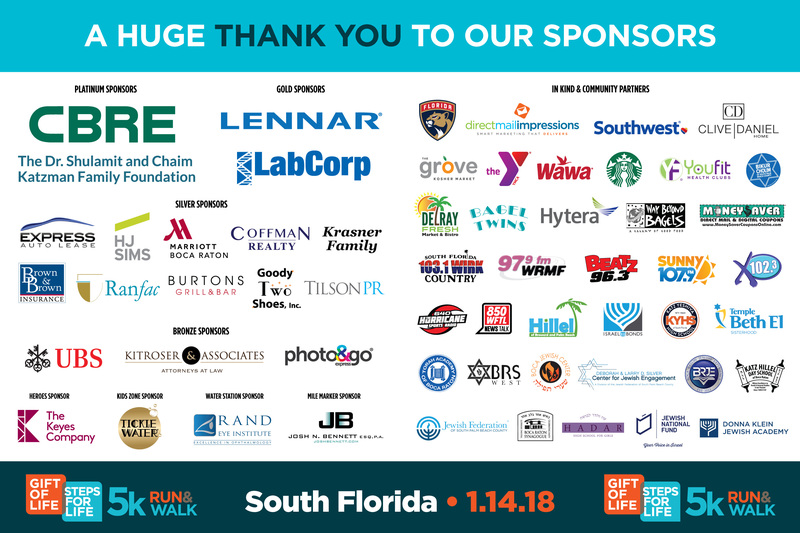 Gift of Life thanks our generous platinum sponsors, CBRE and the Dr. Shulamit and Chaim Katzman Family Foundation, plus our gold sponsors, LabCorp and Lennar. Patients in need who do not have a match in their family have the best chance of finding a donor through the international bone marrow registry. To order your free swab kit and become a volunteer donor, please visit www.giftoflife.org/register. While not every donor is called as a match, you may someday be given the miraculous chance to save another person’s life. 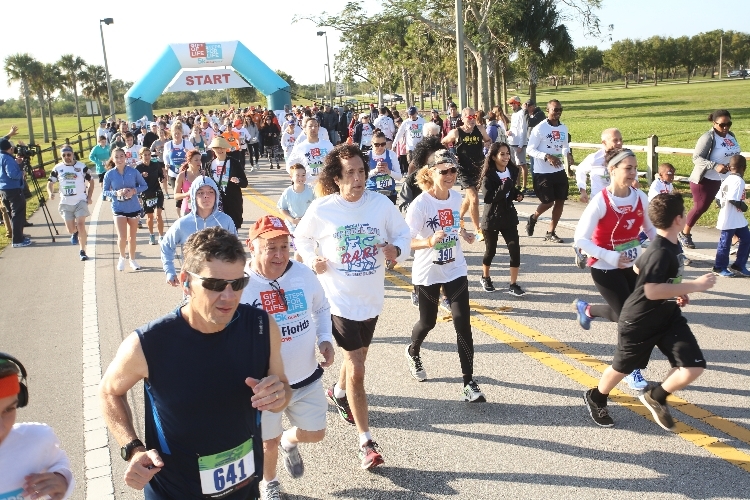 Steps for Life 5K of South Florida 2019 will be held again next January. 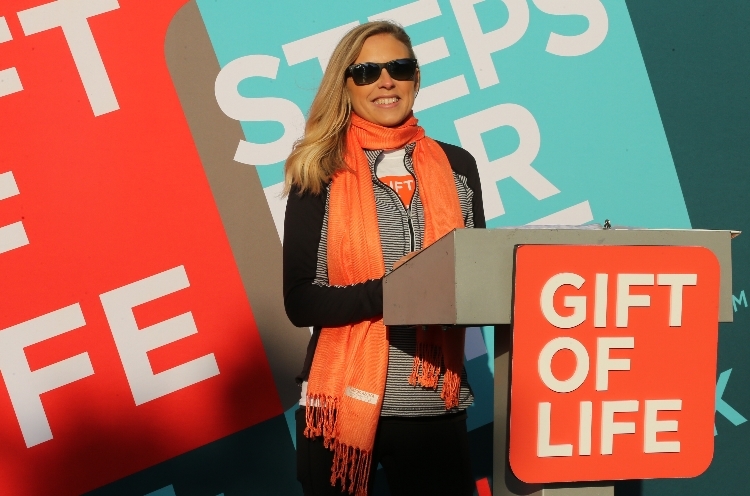 Visit www.giftoflife.org/stepsforlife for the date announcement, or join our mailing list to receive advance notice. Good Samaritan medical student stops abduction. Just over a year later he donates marrow to save another life.